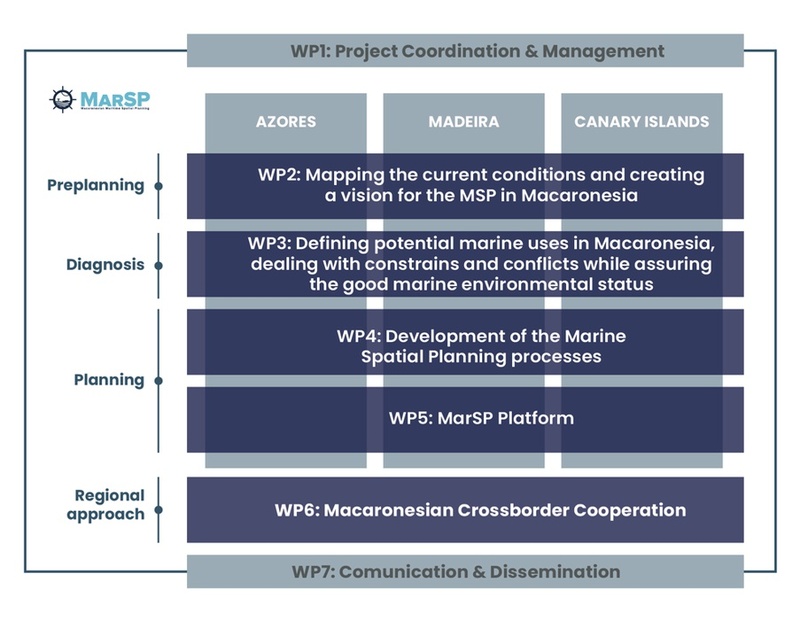 The aim of the MarSP project is to support Maritime Spatial Planning (MSP) processes in the three Outermost Regions of the Macaronesia - Azores, Madeira and Canary Islands, in line with the EU Directive on MSP (2014/89/EU), according to an Ecosystem Based Approach. To develop concrete actions for the Member States - Portugal and Spain, to build the necessary capacities and tools to apply the MSP Directive in the Macaronesian region, including mechanisms for cross-border cooperation. This project also intends to provide adequate management tools, adapted to the regional environmental and socio-economic settings of each archipelago of Macaronesia. Some of the EU regions for which MSP processes have been well develop are located on continental Europe, thus not sharing the main challenges that characterize Macaronesia, such as its remoteness and oceanic features. For that reason, this proposal allows to define new approaches for new problems in the context of the European MSP. It will also help to reduce asymmetries in the implementation MSP associated with the Outermost Regions. Strengthen the Macaronesia position in the international governance context, since the maritime areas present a high demand from several Blue Growth sectors. Current activities, such as tourism, biotechnology, and scientific research, as well other potential activities, namely, deep-sea mining, drilling, and resources prospection may be considered as threats, needing a particular attention. The objective of this Workpackage (WP)is to guarantee a proper coordination, implementation, development and management of the project, in accordance with the GA, controlling the project schedules and budget constraints, while promoting an internal communication between the consortium members. This WP is led by FRCT and involves the participation of all MarSP Consortium members, from the 3 regions of the 2 EU member states (Azores and Madeira - Portugal and Canarias - Spain), that will share the responsibility for the administrative processes, management efforts and technical workout required in each project WP’s. The objective of the WP2 is to assess the current conditions that will bound the MSP processes in each of the three Macaronesian regions and create a general vision for each archipelago (Azores, Madeira and Canarias). To fulfil this objective, each region will identify and map the current maritime uses, activities and restrictions, and identify the similarities among the three visions. This workpackage is led by DRAM and involves the participation of DROTA, ULPGC and IEO partners, which will co-share the responsibility for the work carried out in this WP. The Workpackage 3 objective is to define potential marine uses and the using a scenario-based methodology with multi criteria analysis, dealing with all the constraints and conflicts. Ultimately, this WP intends to identify potential activities uses for the maritime space of Macaronesia, based on the existing knowledge and on the gathered information achieved during the MarSP project. WP3 will contribute to support the decision-making process and therefore, will contribute to support the work of the competent authorities on the allocation strategy definition and the path to the operational MSP steps. This workpackage is led by DROTA and involves the participation of DRAM, ULPGC and IEO partners, which will co-share the responsibility for the work carried out in this WP. The objective of the Workpackge 4 is to develop maritime spatial plans, more precisely 3 plans, one for each Macaronesian region, having in consideration their specific features/particularities and especially the distinct currently stages in each region. This WP is led by IEO and involves the participation of DRAM, DROTA, and ULPGC partners, which will co-share the responsibility for the work carried out in this WP. The objective of the Workpackage 5 is to identify, and if needed, extend INSPIRE data model applicable for MSP and case-study of Macaronesia. For this objective, the findings delivered in the keystone paper “Maritime spatial planning supported by infrastructure for spatial information in Europe (INSPIRE)” published in January 2018 will be used. Further, project partners will be trained to use data model and to publish maritime spatial plans using operational data infrastructure, that will be delivered as a part of the MSP Platforms. The objective of the Workpackage 6 is to describe and analyse the Macaronesia MSP framework and to promote the cross-border cooperation for sustainable growth of maritime economies of Madeira and the Canary Islands, towards the sustainable development of marine areas and the sustainable use of marine resources (Art.1) of MSP Directive. Besides, although there are not international borders between Azores & Madeira, cooperation is also need in regional borders within the same country. For this reason, WP6 will take the opportunity of incorporating Azores archipelago by developing the cooperation tasks in the regional border shared between Madeira and Azores. This workpackage is led by University of Cadiz and University of Seville (UCA/US) and involves the participation of the remaining partners, which will co-share the responsibility for the work carried out in this WP. The objective of the Workpackage (WP) 7 is to raise general awareness of the MarSP project, involving/informing stakeholders and society/general public about its activities and outputs. This WP is led by FRCT and involves the participation of all MarSP Consortium members, which will share the responsibility of the work carried out in this WP, once each WP will produce and provide the communication contents for the development of the WP7.